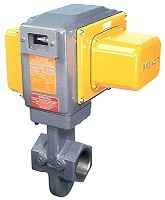 2.5 "Series 5000NI-CP position "R"
3" F Series 808NI-S with flanged body position "L"
Positive visual indication of valve body position is provided by large two-color open-shut indicator. Bodies built for heavy duty industrial service of one-piece cast iron or cast steel. Installation piping convenience obtained from field rotatable top assemblies. Special operating features available in Special Service Packaged versions. Metal-to-metal seating wears in, not out.